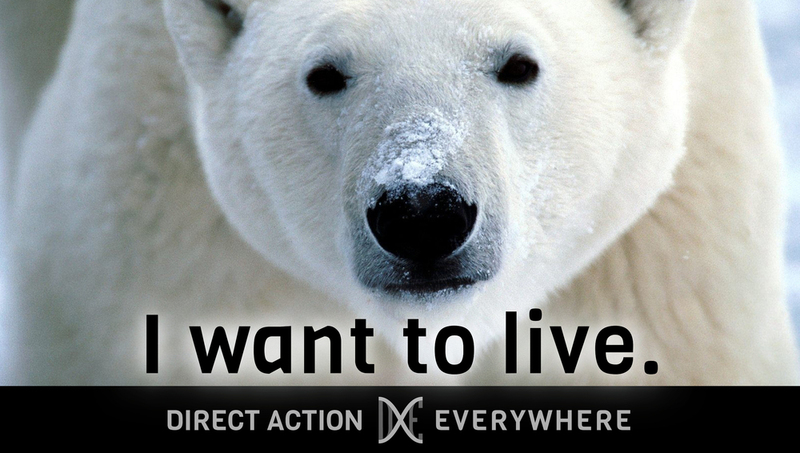 DxE's model is open-source. 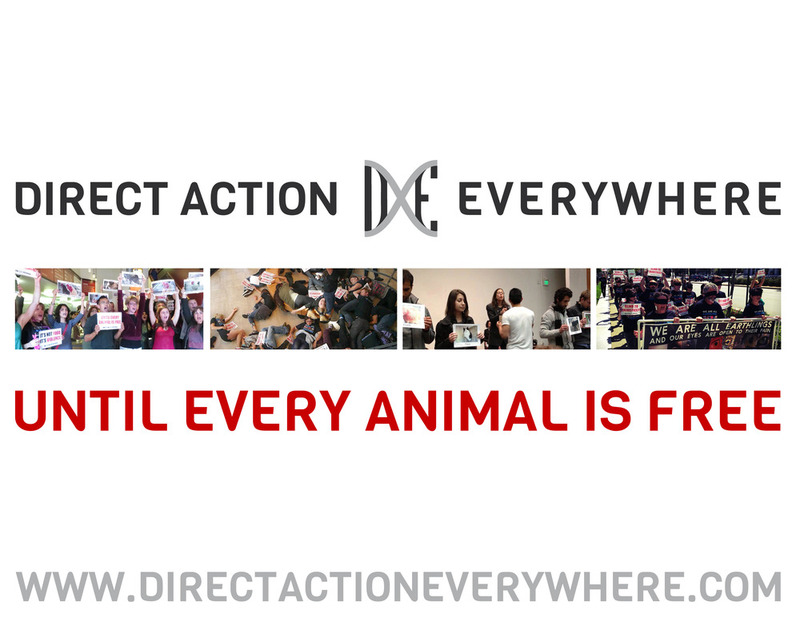 If you follow our Organizing Principles, you are DxE. The following assets are licensed under Creative Commons BY-SA 4.0 and do not require attribution. Can't find anything that works? Submit a design request here. Not sure what to print? These are some of our most used, and most versatile placards - and the perfect ones to start with. "It's Not Science, It's Violence"
"It's Not Beauty, It's Violence"
"Until Every Animal is Free"
"Animals' Lives Are Their Right"
"Humane Murder is a Lie" & "Animals Do Not Want To Die"
"Animals Are Not Ours To Use"
"Their Lives, Not Ours" | "Their Bodies, Not Ours"
"Their Babies, Not Ours" | "Their Children, Not Ours" | "Their Milk, Not Ours"
Click the thumbnails to see each image and story. 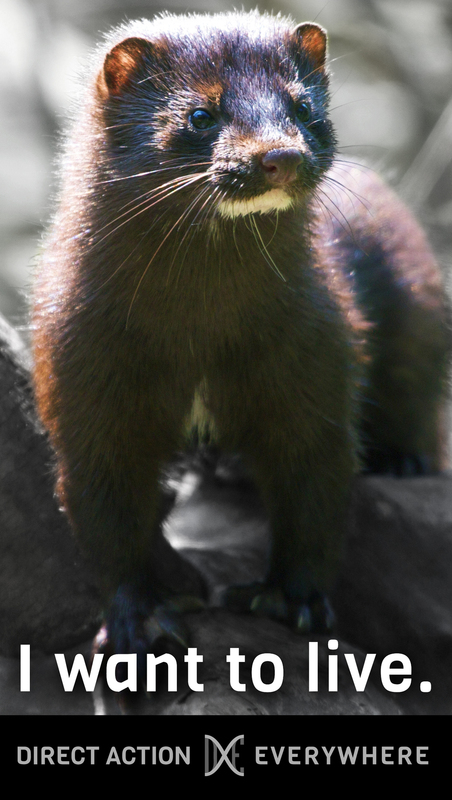 Click the main image to be directed to the full-resolution file. All are sized to be printed at 3x1.7 feet. 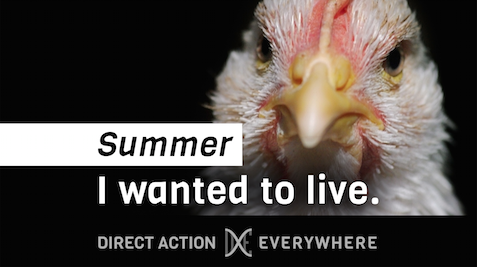 Summer and her sister were liberated from a farm where they were being raised to be killed for their flesh. They were weak, unable to walk, and covered in faeces from the filthy shed they had been confined to. Chickens raised for their flesh are sometimes referred to as "peepers" because they are still peeping infants when they are taken to the kill floor. Bred into a broken body that was made to behave like a flesh-growing machine, her sister died a month after they were rescued. Summer had learned to respond to the name "Little Mates," which is how her guardians called her and her sister. She took to her guardian as the mother she never had, following her everywhere. A heart condition, caused by her breeding, took her away half a year after she made it to sanctuary. 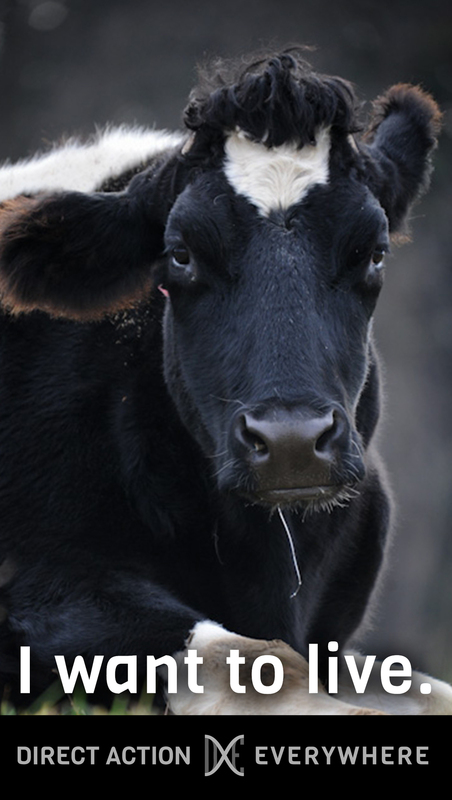 She was buried at the sanctuary, never to be degraded to a "thing" on a dinner plate. (At Lefty's Place.) Photo by Tamara Kenneally. Bobby has a crushed vertebrae, either from rough handling or from having her head stuck in the bars of the battery cage she was liberated from. Her sensitive beak was seared off, like her cage mates' were, so that the trauma of their confinement would not lead them to kill one another. When she was rescued, she had a lung infection, as so many hens in those filthy sheds do. She has nerve damage to one of her eyes, and she has a screw in her gizzard. 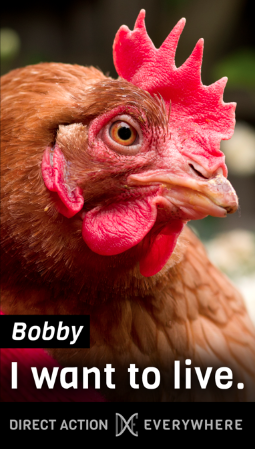 If Bobby were a dog or a cat, her guardians would be prosecuted for this extreme cruelty, but because the animal agriculture industry sees her as nothing but a tool for making profit, she has suffered intensely with no one held accountable -- though we humans are responsible for all the pain she experienced. (At Lefty's Place.) Photo by Tamara Kenneally. 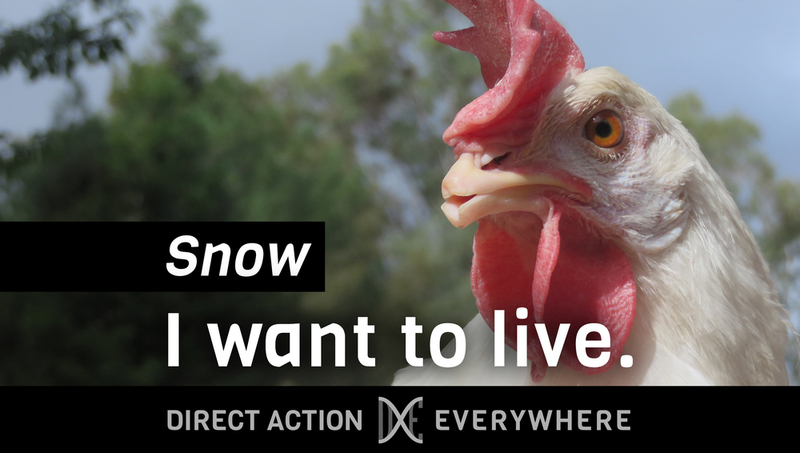 Bowie was found starving to death in a free range egg farm. Somehow, she had escaped the hands of the workers when they came into the shed and picked up the other 60,000 hens, to throw them into the truck bound for the slaughterhouse. Her rescuer saw her cowering in a group of other starving hens, up against the wall of the shed. She cried in the most desperate terror her rescuer had heard when she was pulled away from that miserable place, because humans had never treated her with respect and she had lived in constant fear. After being given the time to recover in a safe, spacious home, with a small flock, good food, and gentle care, she has left her traumas behind and come into her own. The hyperactive reproductive system she was bred with will kill her one day, but until that time, she will live in safety and peace. (At Lefty's Place.) Photo by Tamara Kenneally. 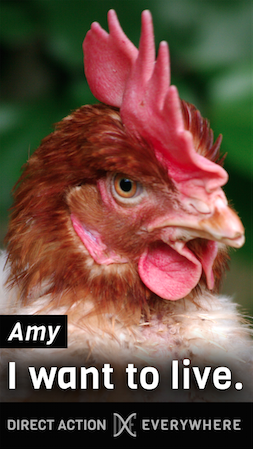 The cramped battery cage caused Amy so much stress that she was nearly featherless when her rescuers arrived. Amy is fierce, and leads her flock. She is now fully feathered, and always has ground beneath her feet. She is one of the lucky ones who got to escape. (At Lefty's Place.) Photo by Tamara Kenneally. While documenting a battery cage egg farm, the two investigators saw Sweetness standing alone in a cage, her sisters having died on account of the terrible conditions they were subjected to. They decided to take her home. She has been nicknamed "Rascal" because she is cheeky and mischievous, and loves to follow her caregiver and peek in her pockets. (At Lefty's Place.) Photo by Tamara Kenneally. Sophia was found by rescuers with her leg trapped under a grate at a "free-range" egg farm. Like most hens on "free range" certified farms, she and her sisters were confined to a shed full of mud, waste, and darkness, with never a moment of sunshine or fresh air. But someone liberated her from that prison and she was free from exploitation for the rest of her life. She was a sweet girl with a big heart, who loved to sit on people's feet. She passed away from a cancer that grew inside of her because the hyperactive reproductive system she was bred with grew old while her spirit was still young. (At Lefty's Place.) Photo by Tamara Kenneally. (At Harvest Home.) Photo by Isabella La Rocca. Because the egg industry has no use for male chicks, Bruce's brothers were discard, while he was taken to feed birds of prey at another place of exploitation. He was rescued and taken to a sanctuary, where he immediately made friends with the resident hens. (At Wishing Well.) Photo by Andrea White. Templeton had never dipped his feet into water before he was rescued. He was being raised in a confined, dark, filthy shed, to be killed so his body could be sold as a food product. But a photographer who was investigating the facility saw him suffering in that awful prison, and she cared for him as much as so many of us do for the dogs, cats, rodents and birds in our homes, and he was brought to sanctuary. Now he gets to swim and play, and he gets to live. (At Lefty's Place.) Photo by Tamara Kenneally. 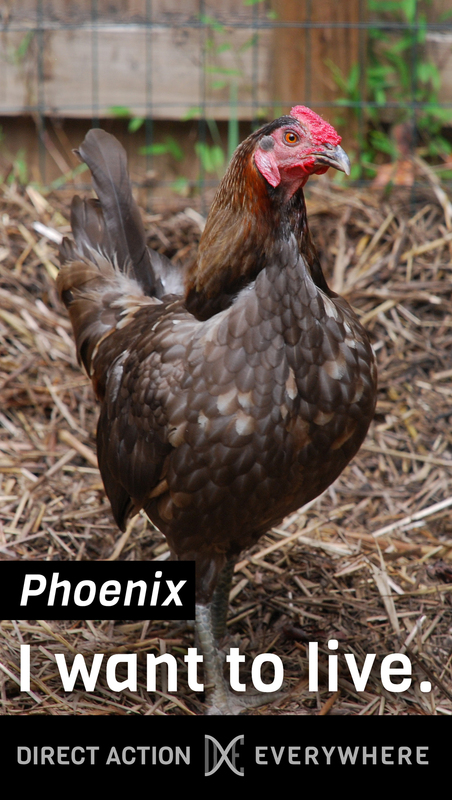 In the middle of a fight that he was forced into through fear and deprivation of basic needs, Phoenix was rescued from a cockfighting ring. He is gentle, and attentive to his flock. He just wants life and liberty. (At Triangle Chance for All.) Photo by Rosemary van Kleeck. (At Animal Place.) Photo by Andrea White. Lily was trained for the big screen, and her trainer, recognizing that she was someone and not something, wanted her to live out a happy life at a sanctuary. Her sisters were not so lucky, but she will never be locked in a gestation crate or killed for her body parts. Lily is gleeful and she dearly loves living. (At Edgar's Mission). Photo by Tamara Kenneally. 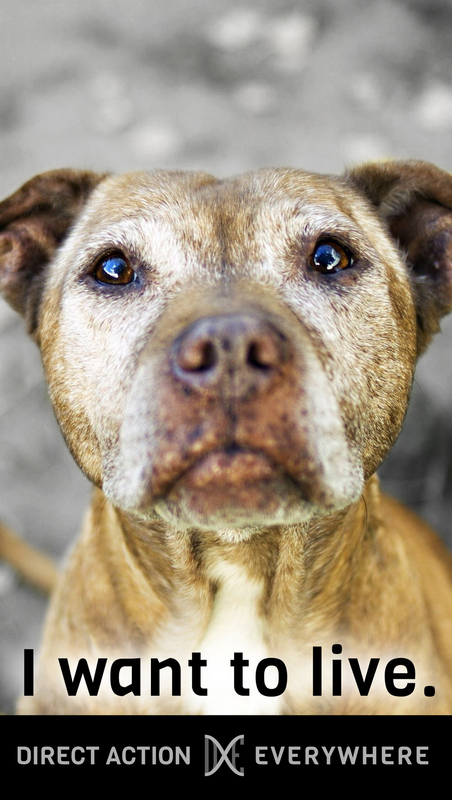 Lucy escaped an auction, and after she was picked up by Animal Control, her life was going to be sold to the highest bidder again. A kind human, who did not like the thought of buying someone as though they are an object of property, but could not stand the thought of Lucy being sold to someone who would kill her, decided to place the highest bid. 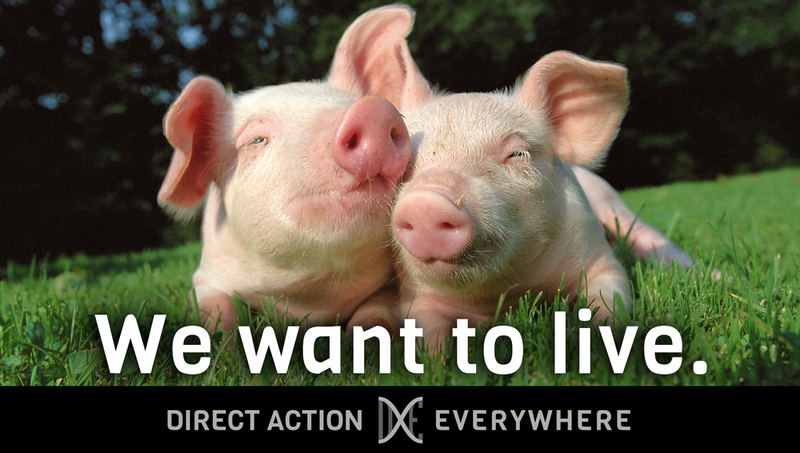 Lucy now lives in safety, with other pigs and loving human caregivers at a huge sanctuary. (At Animal Place.) Photo by Andrea White. Pacific is friendly and gentle. Taken from his mother just after birth, because her milk was being sold to humans, Pacific was going to be killed and his body was going to be sold as veal. But he was lucky enough to secure sanctuary, and will live in safety and happiness for the rest of his life. (At Bed and Broccoli.) Photo by Tamara Kenneally. 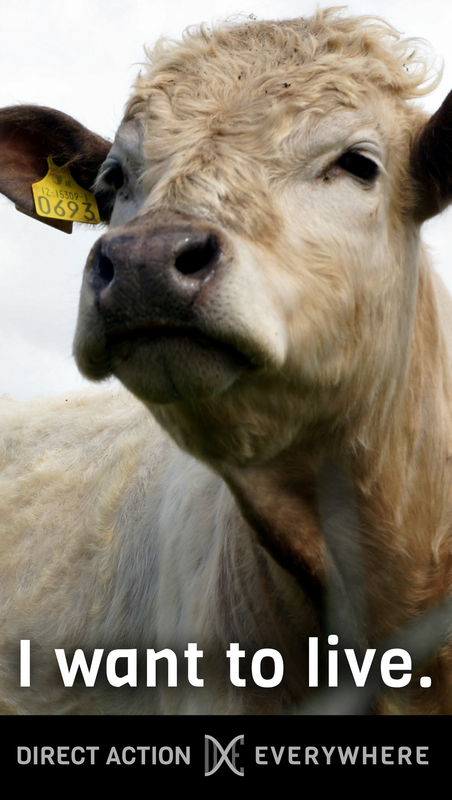 As an infant, Nicholas was bought at an auction, to be slaughtered in a human's backyard. Animal Control retrieved him and he was adopted into a beautiful sanctuary in California, where he will live out his life safe from violence. (At Animal Place.) Photo by Andrea White. Panda was being raised to be used, in a Future Farmers of America program. One night, when he was just a calf, someone broke into the school where he and other animals were being housed, and set him on fire. He suffered severe burns over half of his body, and one of his ears was burnt off. And even after all that, he was still slated for slaughter. But someone intervened and secured his passage to a sanctuary. 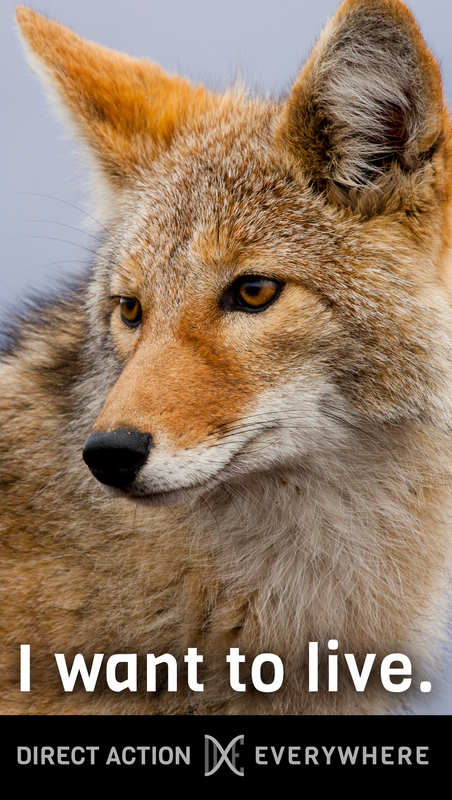 Despite all he has been through, and because he does not know what violence the student raising him intended for him, he chooses to trust humans. 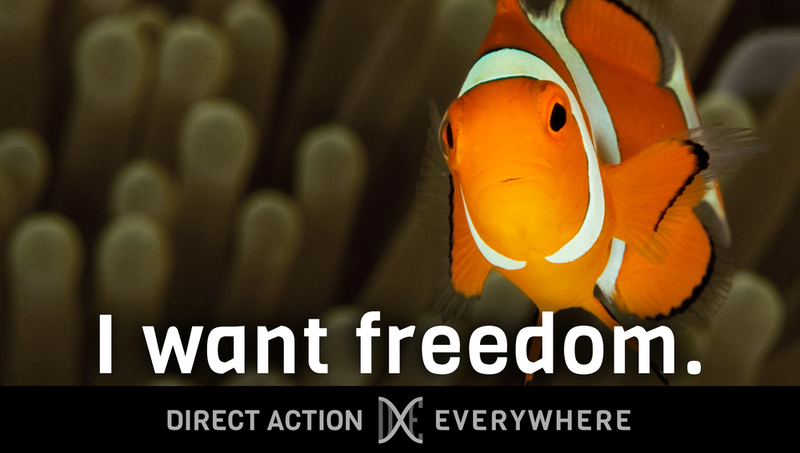 Like every animal, he just wants to live and be free. (At Animal Place.) Photo by Marji Beach. 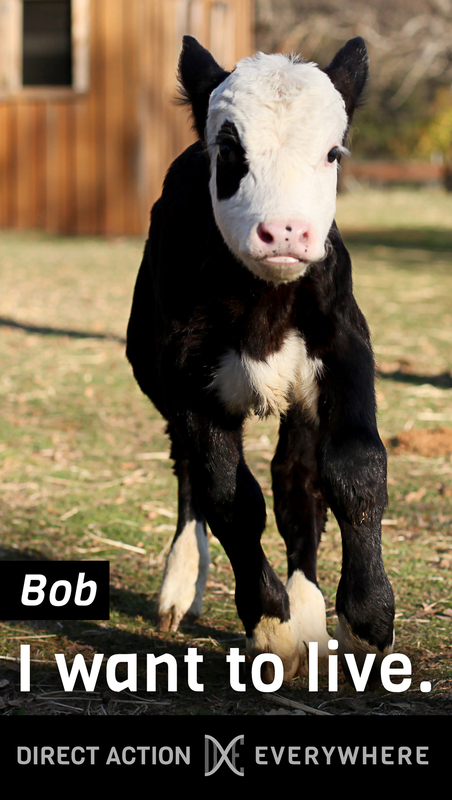 Bob -- sometimes known as Panda Bob because of his colouring -- is a sweet little calf. He was raised in the most "humane" of conditions, where his mother was exploited and he was left alone. If compassionate humans had not stepped in to save him, Bob would have been killed, but now he gets to grow up with his friend Mortimer at the sanctuary where he will live out his life free from harm. (At Animal Place.) Photo by Andrea White. 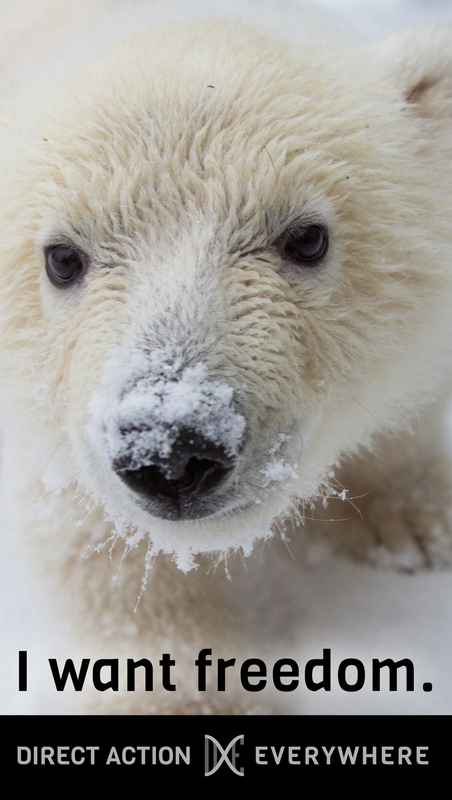 Greedy and his brother were just a day old when they were found, abandoned and near death, in an icy field in the winter. Rescuers brought them to the safety of a sanctuary. Greedy got his name because he was very excited about his bottle. Two days later, he was found to have a severe infection, but he fought to live and with the help of caring humans, he survived. One night, when he was several months old, he didn't come home from the pasture -- he was found, crying in distress, with his leg stuck in the fork of a tree, after a fox has started chewing his face. But he made it through this too, and he continues to live at the sanctuary, where he appreciates every day he's alive. (At Lefty's Place.) Photo by Tamara Kenneally. Junior was destined for the salesyard, but the farmer who bottle-fed him didn't want him to be killed. 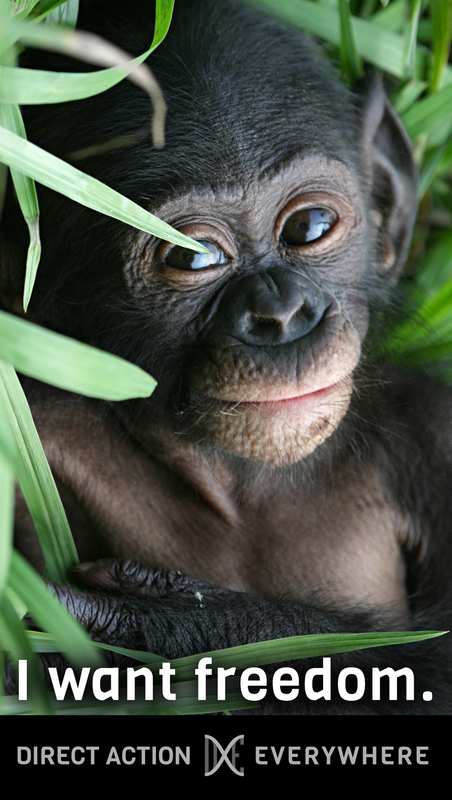 The farmer contacted a sanctuary, and now Junior will get to grow up, in safety, and live out his life. (At Lefty's Place.) Photo by Tamara Kenneally. Pancho is a stubborn sheep, who had no idea how lucky he was when someone lifted him out of the abattoir line. (At Lefty's Place.) Photo by Tamara Kenneally. Limpy's rescuers saw him standing over his murdered friend at the salesyard where he too was taken to be sold and killed. Because of the abuse he faced as a farm animal, he had a severe leg injury, which was never treated and has left him with a permanent limp. His rescuers brought him to safety. Because of his emotional traumas he is still terrified of humans, but no one will ever hurt him again. (At Lefty's Place.) Photo by Tamara Kenneally. Annie was trapped in a farm where the animals were being held in terrible conditions, by humans who meant to rip open their throats and sell their bodies. Animal control shut the violent operation down and Annie was brought to a sanctuary along with seven other animals. 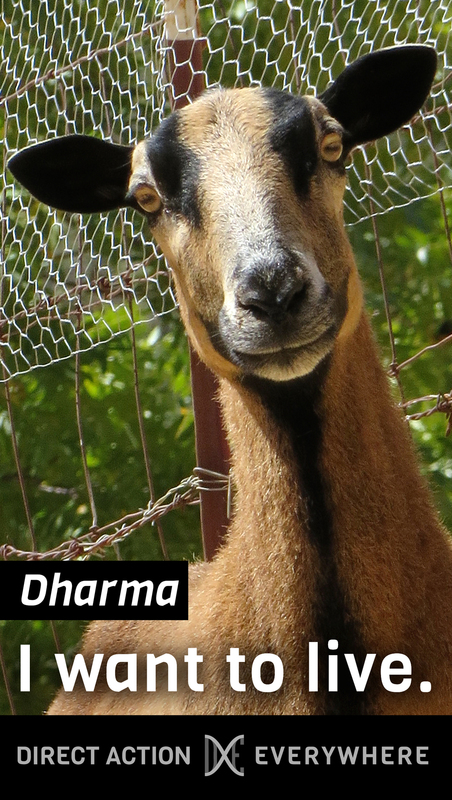 She doesn't trust humans, but she lives in safety and has the love of her herd. (At Animal Place.) Photo by Andrea White. Hunter and his brother Orion were taken from their mother and sister just after they were born, like most infant males born to mothers who are exploited for their milk. He and his brother were lucky enough to make it to a sanctuary, but their sister and mother remained trapped on the farm where they were exploited and eventually killed. Because he was separated from his mother so young, he required veterinary care when he was rescued, but because of the care and protection of his guardians he is growing up in health and safety. (At Danzig's Roost.) Photo by Penelope Green. Noah's mother was pregnant with Noah and his brother Cornelius when she was about to be shot, dismembered and eaten. An officer who took pity on her convinced the man who would have murdered her to release her, and she was taken to a sanctuary, where she gave birth to Noah and Cornelius. Noah and his brother are playful and sweet and have a total love for life. Noah is one of the lucky few goats who have never and will never know what it is like to be degraded, hurt and killed by violent humans. (At Animal Place.) Photo by Andrea White. Monty's breeders valued his life by the profit he could make for them. Because he wasn't what they wanted, he was to be sent to a slaughterhouse. But luckily for Monty, thanks to the efforts of someone who knew that the real value of his life was in how much he wanted to live it, he was released to a sanctuary. (At Edgar's Mission.) Photo by Tamara Kenneally. (At Edgar's Mission.) Photo by Tamara Kenneally. 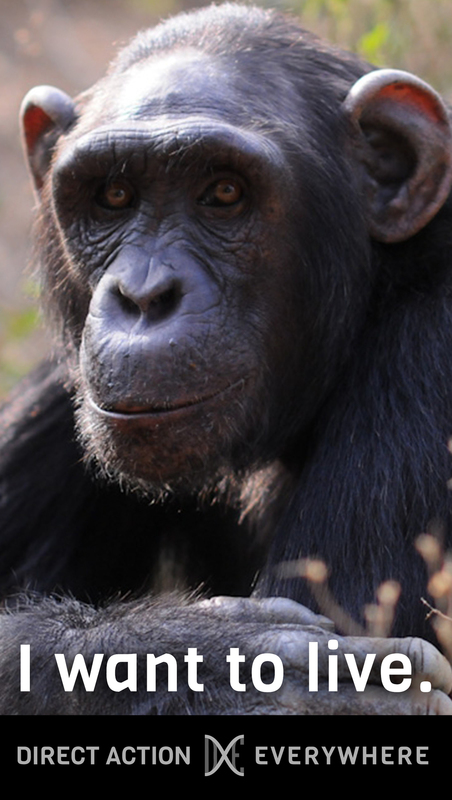 Photo credit for chimpanzee, rat, black cow and white calf to Jo-Anne McArthur / We Animals. Photo of the leghorn hen by Animal Place. 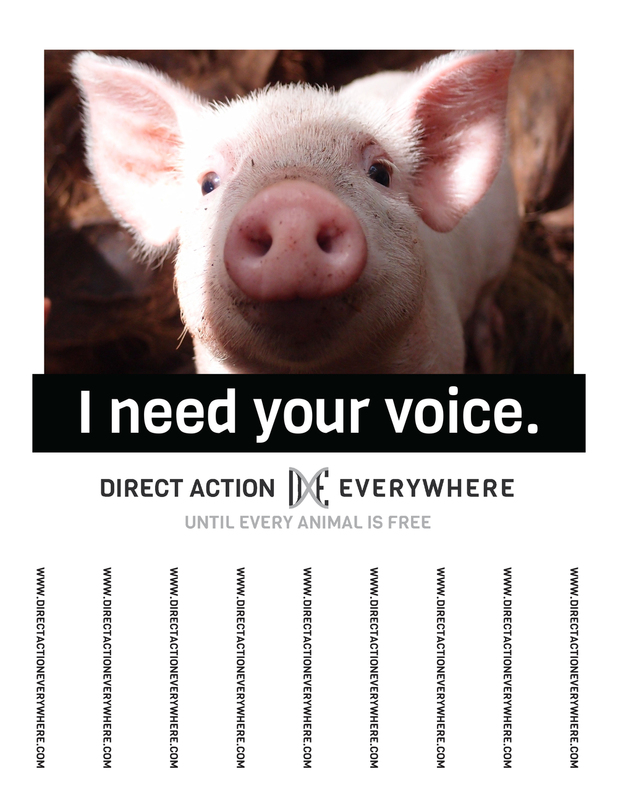 Photo Credit for cows to Jo-Anne McArthur / We Animals; for chickens to Animals Australia. Click here for 6 by 2.5 foot banner design. Clarification: The "mother" is the cow, the "baby" is the pig, and the "girl" is the chicken. Note that the files in the download links for the chicken, cow and pig voices are 10 minute long audio loops. These stickers are drawn and designed by Yi Yi from DxE SF Bay area. Can be printed on Avery 2.5 inch Kraft Brown Round Labels. Plakater: "Jeg ønsker at leve." "Je veux vivre." Lucy, Charlie, Bob, Nicholas, Bruce, Snow. Anonyme: Vache, veau, poulet, autre poulet, cochon, poissons. 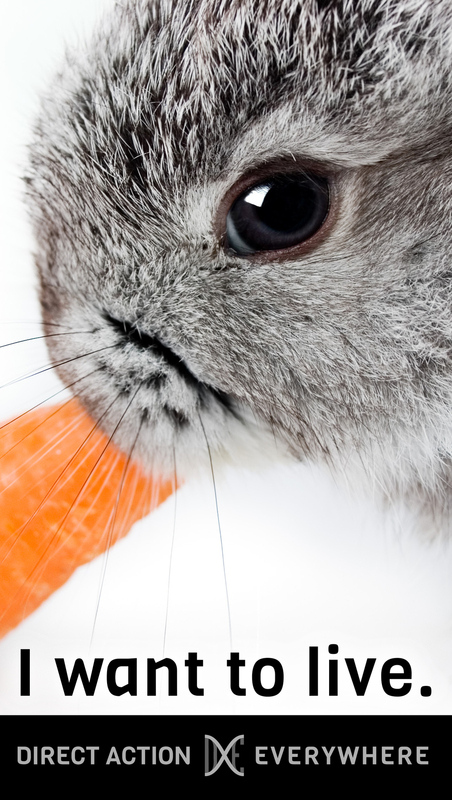 Nous N'Oublions Pas: Poulet, poulet, poulet, cochon, vache, veau, renard, coyote, vison, rat. Le veganisme n'est pas suffisant.